Since the beginning of the year we have had several snow falls. The woods are covered with knee-deep powder that is perfect for snowshoeing and watching the dogs play. In celebration of all the wintry white stuff, I have put together a small collection of platinum and white gold cufflinks that shimmer and sparkle like fresh snow. Wordley, Allsopp & Bliss frosty octagons, circa 1925. These brilliant Wordley, Allsopp & Bliss cufflinks sparkle with wintry elegance and pizazz. The frosty white cufflinks feature pendant garlands (mistletoe?) surrounding snowflake-like centers. A dramatic border of boxes and crosses frames the design. Crafted in 14kt white gold, circa 1925. Heidelshimer diamond and platinum cufflinks, circa 1920. 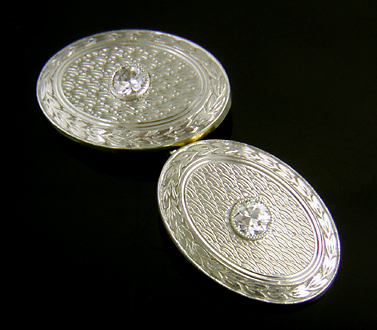 Elegant early Art Deco cufflinks set with sparkling diamonds. The platinum tops are beautifully engraved with repeating sunrise or wave motifs and surrounded by laurel wreath borders. The diamonds are set in platinum bezels with mille grain edges. Created by Irving Heidelshimer in platinum and 14kt gold, circa 1920. 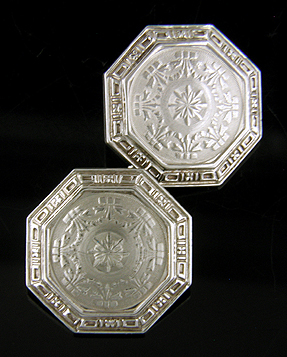 Finely engraved "TH" maker cufflinks, circa 1925. The finely engraved centers of these cufflinks from the "TH" maker shimmer like fields of fresh snow in early morning sunlight. The Art Deco palmette corners and stylized water lily borders offer a sunny counterpoint to our wintry theme. An elegant pair of cufflinks adapted for all seasons. Created in 14kt white and yellow gold, circa 1925. 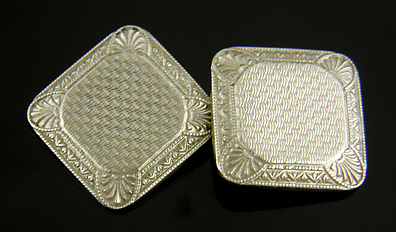 Fritschze frosty white gold and diamond cufflinks, circa 1925. Mysterious marquise-shape cufflinks with dramatically engraved centers and undulating borders of stylized water lilies. A small diamond set in a box setting with mille grain edges sparkles in the center. Created by L. Frtischze & Co. in 14kt white and yellow gold, circa 1925. 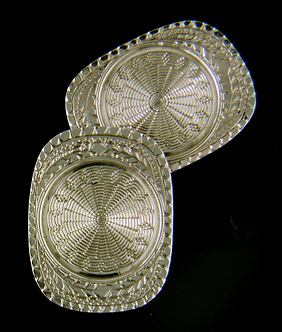 Ziething intricately engraved cufflinks, circa 1925. No note on shimmering wintry cufflinks is complete without a mesmerizing pair of intricately engraved cufflinks by Ziething & Company. Crafted in white gold, these cufflinks almost burst with myriad, exuberant designs. A wonderful example of the early Art Deco passion for rich details and embellished surfaces. Crafted in 10kt white gold, circa 1925. Recent additions to the Antique Cufflink Gallery include elegant Art Deco jade and gold cufflinks and a trinity of navette-shape (elongated hexagon) cufflinks from the early 1900s. Jade and Gold The Art Deco era was in love with bold, contrasting colors. These elegant cufflinks feature dark spinach green jade set in brilliant yellow gold. Crafted in 14kt gold, circa 1925. Art Deco Beautiful Art Deco cufflinks with black enamel accents nicely complemented by intricate linear and geometric motifs. Crafted in 14kt gold, circa 1925. Midnight Blue Elegant cufflinks with rich blue gemstones that bring to mind dark night skies with a few wispy clouds illuminated in the moonlight. Crafted in 14kt gold, circa 1920. Elegant Scrolls Elegant elongated cufflinks with sinuous scrolls and dramatic darts. Designed in the eclectic Beaux Arts style of the early 1900s. Created by Wordley, Allsopp & Bliss in 14kt gold, circa 1910.